Disclosure: I will be given a complimentary camp registration in exchange for promotion on my blog. All thoughts and opinions are my own. 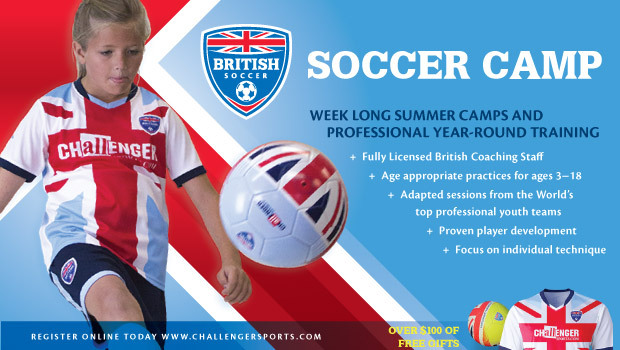 We are excited to have the opportunity to participate in the Challenger Brittish Soccer Camp again this summer. Rebekah, our "Soccer Star" had so much fun last year. Our 2015 Week of Camp in Review is found here. Lots of teamwork was taught and although the skills were worked on and improved, I found the biggest change was in Rebekah's communication on the field with her teammates in the fall. She was also more encouraging when things didn't go right. I attribute a lot of that to what I observed when she was at camp. Rebekah loved learning more about other countries and had lots of questions about Great Britain for our coaching staff. She still proudly wears the jersey she received (for early registration) to many of her soccer practices. Her complimentary ball is used every week and she has been asking if she can go again this summer. I knew there was a rumor that our location might be cut, but I'm thrilled that we are still on the list. New location, but we will still be able to go to camp. More about the program: British Soccer Camp is the most popular camp in North America - 150,000 campers! With an innovative curriculum that develops skills, speed and confidence in players ages 3-18, British Soccer Camps provide boys and girls with the rare opportunity to receive high-level soccer coaching from a team of international expert's right in the heart of their own community. In addition to teaching new skills and improving game performance, each British Soccer Camp provides lessons in character development, cultural education and is the most fun your child can have learning the sport they love!